Fast-Fill / Quick-Fill Device (Q.F.D.) :: :: iSoaker.com ::: iSoaker.com | The Armoury - Fast-Fill / Q.F.D. Description: The QFD (Quick Fill Device also known as the Fast-Fill Device) was first introduced with the Super Soaker Super Charger Series (SC) in 1999. 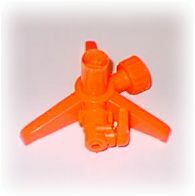 Designed to fit standard garden hoses, the QFD allows all SC-capable blasters to refill simply by inserting the blaster adapter into the active QFD. The main drawback to this QFD is that the hose can only be used for refilling SC Super Soakers® while the QFD is attached. Other water weaponry can only be refilled if the QFD is removed. Description: The QFD: Type II was introduced with the Super Soaker SC Series in 2000. Its design and purpose are basically identical to the original QFD design. 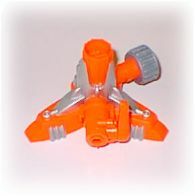 However, a feature was added to allow normal water blasters to be filled by opening the valve on the base of the QFD. This addition feature proves useful as the hose no longer needed to be solely a dedicated SC-capable filling station. It should be noted, however, that the rest of the QFD's design remained intact, meaning that it is backward-compatible with earlier SC-capable soakers. Description: The QFD:Monster was introduced with the Super Soaker Monster Series in 2000. Like the two before mentioned QFDs, it was designed to fit standard garden hoses and allow all SC weapons to refill simply by inserting the blaster adapter into an active QFD. 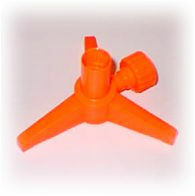 Like the QFD: Tyle II, normal blasters can still be filled by turning the valve on the QFD to the "On" position. However, unlike the other QFDs, this one is specially reinforced around the point of entry for the Monster-class weaponry in order to accomodate the added weight of these blasters.